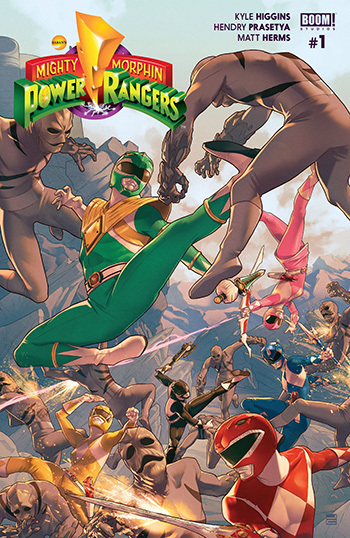 Mighty Morphin Power Rangers issue 1 is best described as Green Ranger year one. Taking immediately after the Green Ranger Saga where Tommy Oliver was under Rita’s spell to be her evil Ranger and destroy the other Rangers along with Angel Grove. The story starts with Bulk & Skull recapping the events of what took place in Angel Grove from their perspective for their TV show. They recap Rita’s invasion of Earth, the Power Rangers first appearance and saving everyone in town, and Rita “creating” the Green Ranger to battle the Rangers. 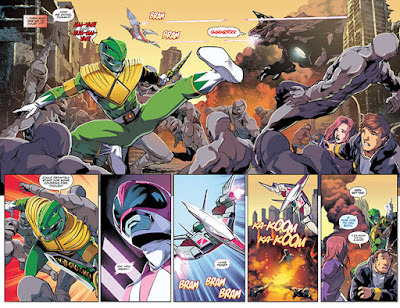 The biggest news story going around now is that the Green Ranger has teamed up with the Power Rangers to take on Rita. As Bulk and Skull go around the city asking people how they feel about this, the reactions are a mix of positive, negative, and lots of confusion. Of course when asking fellow classmates, who happen to be the Power Rangers unbeknownst to them, while happy that the Green Ranger is on the team the lack confidence behind their answers is evident. Even Tommy himself is finding it hard to be positive about the situation. As the day goes on he struggles with his own self doubt so much that he thinks he’s hallucinating images of Rita taunting him. What he thinks are hallucinating is actually Rita’s latest plot for revenge against him. Even though things with Tommy are bad, we get a hint that things at home with Zack aren’t in a good place either. I’m glad Boom! got the comic book rights to MMPR. I’m big fan of their other works such as Adventure Time, Bravest Warriors, and Crimson. The artwork alone is worth picking up, the colors and the line art have a real serious look to them. Not cartoonish at all and still retains the feel of the original show, but better storytelling. I do wish they had started out with the Green Ranger Saga just to see how they would have told that story. I’m glad that it is a year one for the Green Ranger just because I thought his character was too short lived on the American TV show. I do like that we get to see the beginning of the romance between Tommy and Kimberly and eventually see it fully bloom. If you’re a fan of the original show you will definitely love this series. For those that weren’t a fan you will become a fan of this comic book series at least. For newcomers to the Power Ranger fandom you may want to brush up on the series through Netflix first as to not feel lost. For this first issue I give it 5 stars not just because I'm a fan of the original show, but because it is really great storytelling that did more than the show could. The Ongoing Adventures of Bulk & Skull is a nice mini story with a more comedic tone befitting everyone’s favorite bullies. It has a cartoonier feel to it which matches perfectly with the characters and the story is definitely something typical of their get rich quick schemes. 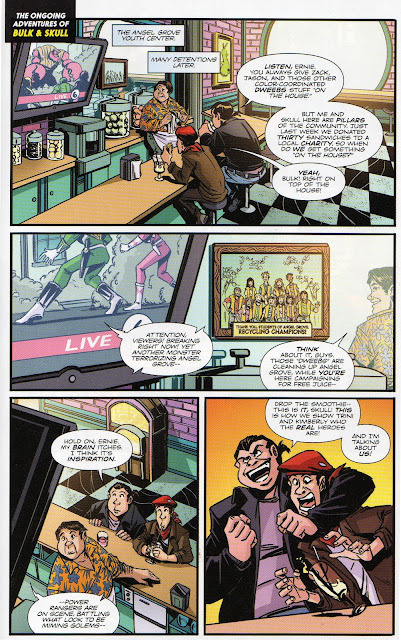 Story starts off with our heroes at Ernie’s bar sulking as to why they can’t dates with Trini and Kimberly. Then as the news broadcast that the Power Rangers are in the midst of battle, Bulk gets the idea that in order to impress the girls they need to get in the middle of that battle and defeat the monster before the Rangers do. Of course no one with half a brain would ever think of this, but even with 2 brains at work, it’s a great recipe for total comedic disaster .